Not as many fun little games, this time around, but weeks 61 through 90 brought about a few changes. For starters, Coders Workshop closed down in week 64, which meant the whole Wed.Workshop thing was without a home. Consequently, I spent most of this period building up the whole Socoder website.. from scratch.. in notepad.. So, I missed a few workshops! As such there's only actually 14 games in this selection. There are some super special games, though. The "CodersWorkshop" game is a miniature Top-down, Romp-around, Dungeon-esque game, only without much of the needed gameplay elements! There's a decent Picross game, with included Level editor. There's experiments with transparencies, tests with strange window resolutions, and there's even a backwards game thrown in for good measure. You can Download the Collection here, and for more of the same, check out Weeks 01 - 30, 31 - 60 and my complete entry list. Imagine if all your favourite Arcade games were in fact Slot Machine games. 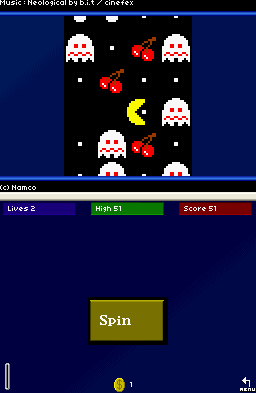 Arcade Slots reproduces a handful of games in this style. With games ranging from Frogger to Hogan's Alley, there's plenty to keep your playing. 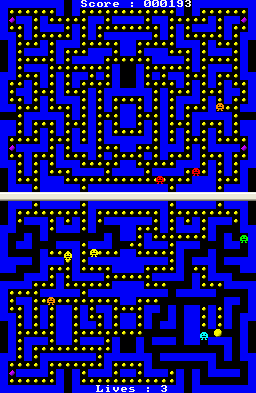 Spin the slots, and hope that Pacman can get across the level without hitting any ghosts. Eat the power pellets to give him more of a chance. Pick one of three positions to set Frogger off, spin the slots, cross your fingers, and hope for the best as he hops his way across the roads and rivers. 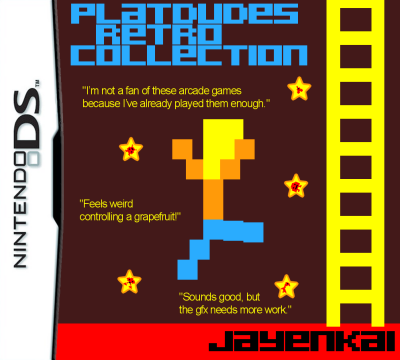 OK, so this isn't really a classic arcade game, but it's fun to see Platdude run along the levels anyway! Expect even more finger-crossing, as he tries not to run into any spikes. 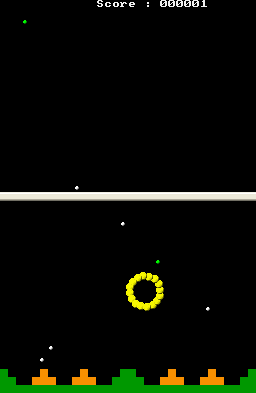 In this game, the reels automatically spin. 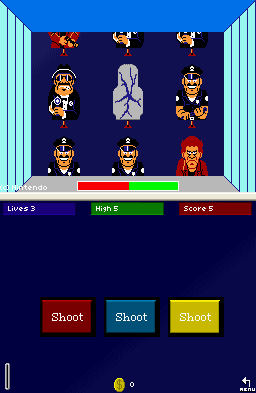 You have to hit the three buttons to shoot the bad guys. Try not to shoot the goodies! 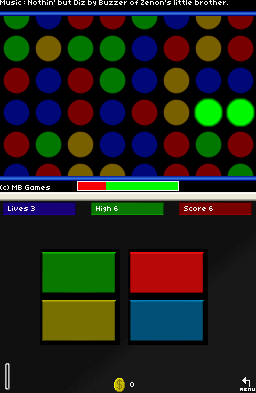 Wait for the reels to stop, then hit the four buttons in the order shown in the center of the screen. 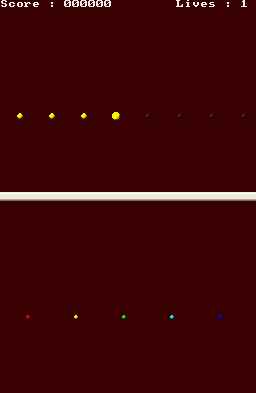 Using only three nudges, try to line up as many horizontal lines of gems as you can. A nice slow-paced thinking game. If Centipong was a simplistic looking game with added 3D, Blockman would be the exact opposite. 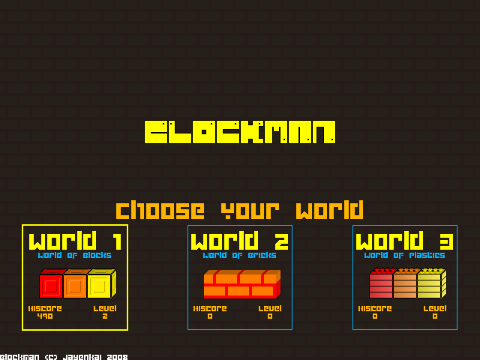 With levels so colourful they'd poke your eyes out, Blockman comes hopping along to rescue all the Blocklets. It's a rather simple game. Grab the Blocklets, take them to the door. You can bring as many as you can to the door at a time, but the more you get safely home in one go, the more points you're awarded. 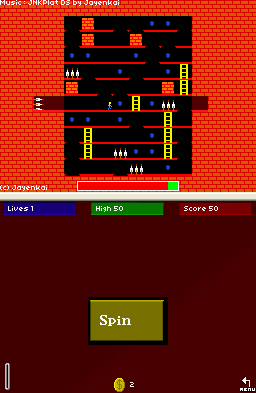 Over the past few days, I've been building up Centipong bit by bit, and it's now become a much nicer game to play. 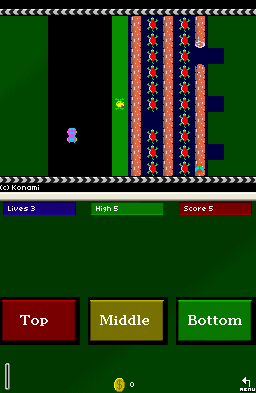 There's levels to beat, pickups to collect, and more centipede pods than you can shake a paddle at! If you enjoyed the previous version, give the new version a try. You'll love it! What happens when you take 2 classic Atari 2600 games, and stick them together? 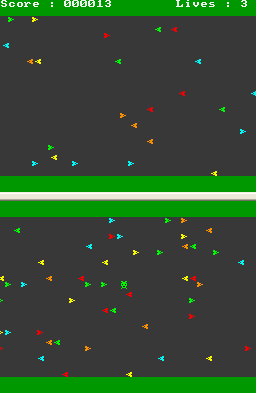 Centipong mixes Centipede and Pong to create a really weird almost-psychedelic game. Smash the ball at the Centipede repeatedly. The DrunkenCoders Christmas Compo finishes tonight. I bothered to enter the new JNKPlat Xmas Special (You can download that here) but it's nothing too special.. 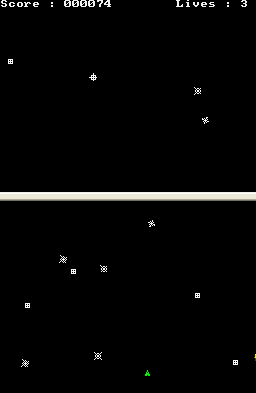 So, this morning, at around 8am, I decided to get my arse in gear and actually make something nice and snowy for the compo. Around 5 hours later, give or take, and Snowman Attack is the result. 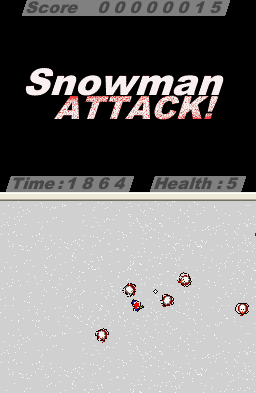 Run around and shoot the snowmen before they get you. You have 5 bits of health and a constantly running countdown. There are 4 powerups available, for health, extra time and weaponary. 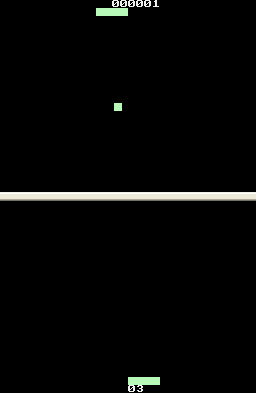 A nice simple game, made quickly! No hiscores, no online abilities, and not even any music. Note : This is much more Game-Specific than my regular posts! 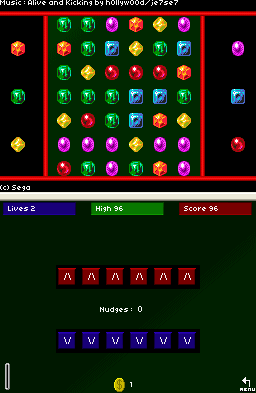 Bombliss is one of my favourite alternate Tetris games. It has all the playability of the original Tetris, and it also has bombs, and chain reactions and things, too. 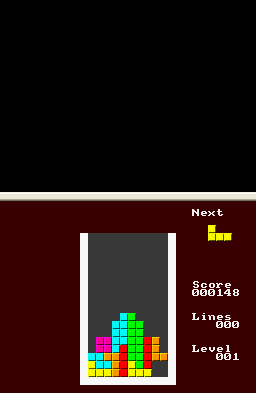 Last night, I opened up the Tetris sourcecode for the Retro Collection, and started hacking away for it's Xtra Mode. (renamed so it looked more obvious on the menu) For reference, to start a Xtra Mode game, either hit X to start the game instead of A.. OR tap the far right of the menu item, where the new X's are. So, starting off badly, things got progressively worse! 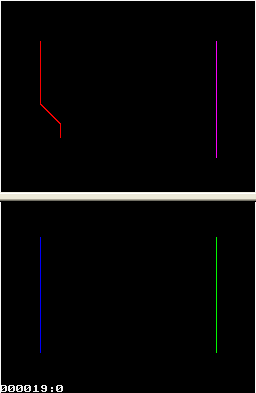 First up, not only did the blocks have to rotate shapewise, but they now had to rotate "bit"wise, too. 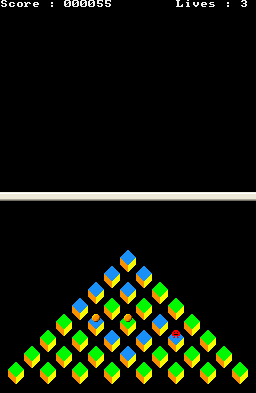 That is to say, once you start adding bombs to specific parts of a Tetris block, those bombs have to rotate into the right places as the pieces spin. That was awkward enough, and took quite a rewrite of my spinning routines to get it going right. Happy that it now worked, I started adding the bombs into the play area. 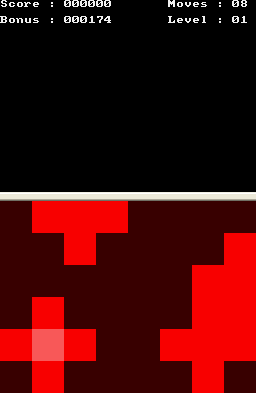 That was easy enough, since they're just layered over the standard array, and drawn on a foreground layer. Nice and easy to keep track of. Unfortunately due to the fact that I have no "Big Circle" sprite, I haven't added in the "2x2 Big Bomb" object. If I can figure out how to do it in the next few days I might add it back in. For the meantime, it's MIA. Then came the time to add detonations. At this point I had to play Tetris Blast on my old Gameboy several thousand times to work out exactly how it all worked! I think I got things pretty similar, although minor differences will probably be noticable. Detonations over with. 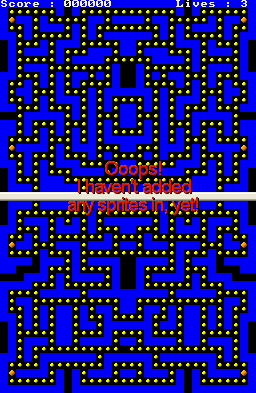 I was starting to feel proud of my tweaks, and replayed the game in classic mode to be sure I hadn't broken the original Tetris game in the process. If anyone else is recreating Bombliss, perhaps this might help. Do the checks line by line. 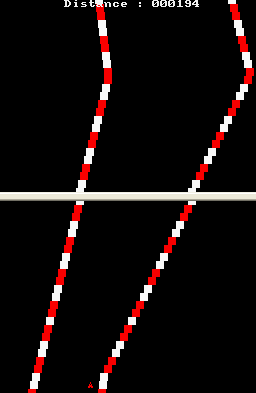 For each line, find each group of blocks. If any block in a group has a block under it, hold the group up, otherwise drop the group. Much easier to do it line by line, than having to check every possible "under" block of every brick within a whole multi-line group! And so, there it is.. Bombliss. It's done and dusted, and I'm pretty happy with it. I still have to tweak that 2x2 Bomb in, somehow, and I'm sure the scoring's totally off by this point, but it's at least playable the way it should be, and I'm happy that I can finally play a decent Tetris AND Bombliss on something other than my aging gameboy! Long live Tetris+Bombliss! 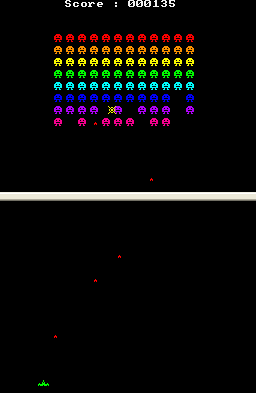 Oh, and I got ship-diving and power ups in the Invaders Xtra game, so it plays a bit more Galaga-Like.. Yeay! Not sure when this next release will appear. Maybe once I've added plenty of Xtra modes.. But more than likely once I've added another 6 brand new games, instead! The whole Gabby Gets a Turkey (logo on last week's post) game is being scrapped due to bizarre scale issues!? A white cat in white snow is a nice idea, except when you realise that a 16x16 pixel head is going to need a huge non-existant body behind it!? The whole thing just felt really odd, and I decided to just scrap it instead. 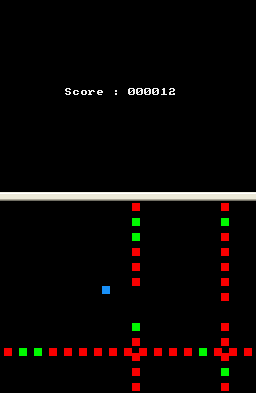 I know that the Drunken Coders people hate entries that are "X game + Xmassy theme added on later", and I came up with the Gabby game so's it definitely didn't feel like a tacked on theme.? ? That didn't work out, and for some reason (probably "18 games in 3 weeks" related) I'm all out of ideas. So, if I want to do something for their compo, I'm going to have to go the "Tacked on" route, no matter what.? And if I'm going to do the whole "Tacked on" thing, I might as well do it in a way that most people would still enjoy. Not sure exactly how to make everything super-xmassy, but there'll be presents involved somewhere along the line! In the meantime I've added the first plus_mode to the? collection, with Invaders now occasionally dropping down ala Galaga.? 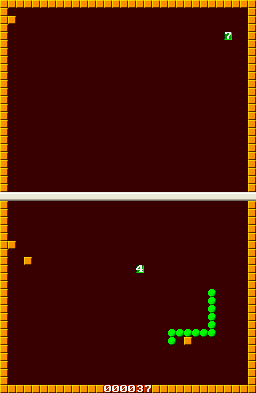 I'm about to start adding some powerups, but am unsure what sort of powerups to add..? I think Double+Triple shots might be TOO powerful..? Hmm..
Wednesday, the 4th day of rest..
Those expecting another Saturday filled with happy retro memories have a long wait. During this week, though, I've been thinking about Galaga. On the one hand, it'd be nice to make a tiny retro version of the Amiga classic "Deluxe Galaga" along with attack waves, and powerups and all that jazz. 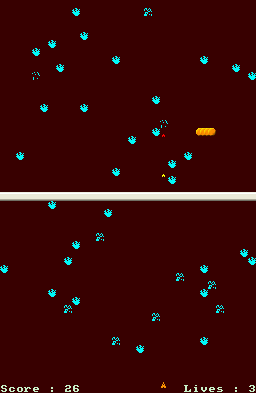 On the other hand, I could just add powerups to Invaders, and quite frankly that'd be decent enough. There's already Invaders, Asteroids and Centipede. Surely that's enough shooters, right? 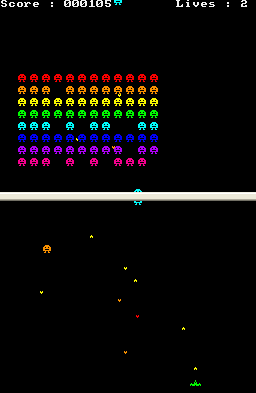 But then, if I add powerups to Invaders, you lose the plainer version of Invaders. 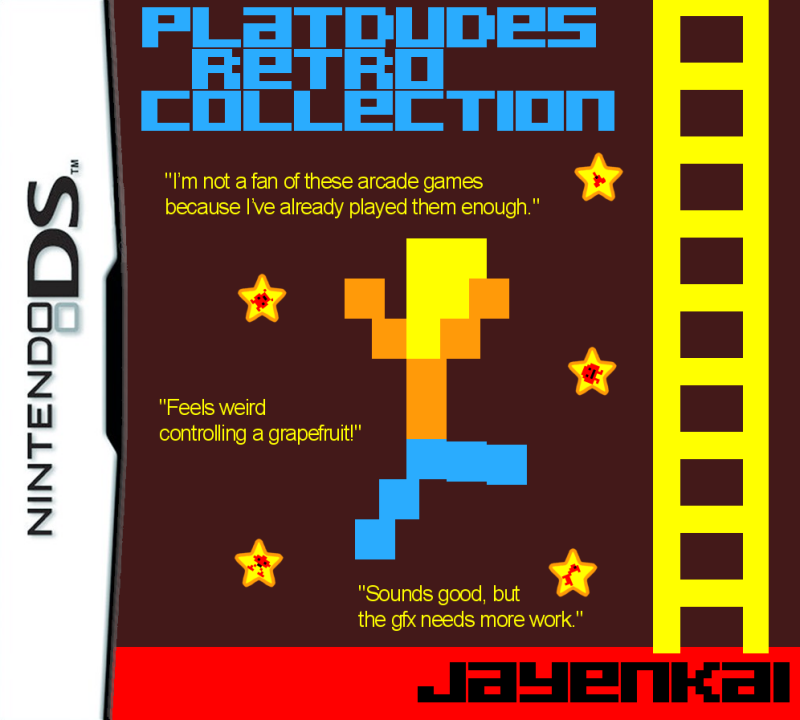 What I'd need is some kind of extra option in the menu, somewhere, to let you switch between "Invaders" and... .. "Invaders Plus"
"Platdude Retro Collection : 18 Plus!" That sounds a bit of a dodgy title! But I think that's what I'm going to aim for. So, over the next few days I'm going to be jotting down a few ideas, (I have my pad at the ready) and seeing if I can impliment some of those into the already existant games, to build up a collection of "Plus" versions for each. Tetris's "Plus" mode will more than likely be Bombliss, because I've been saying for a couple of weeks that I should make that. Well, lets just say that Suggestions are welcome! 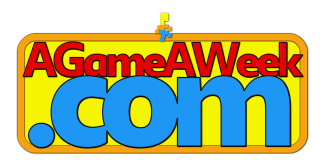 Oh, yeah, and here's the logo from my Drunken Coders entry, if I bother to finish it..
Another week, another pile of retro-mania! You get the idea by now, 6 extra games and the odd bugfix. 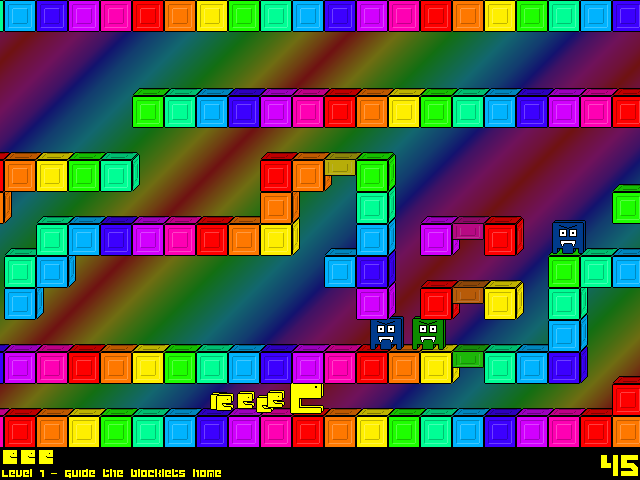 I had to redo a lot of Tetris, this week, since I'd ballsed up quite a bit of it last week! 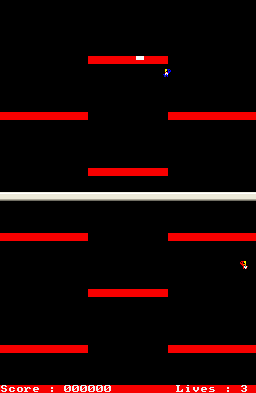 But it's all working rather well now, so you can happily settle down to a nice long game on Extreme modem and it'll now actually get faster as you head up the levels! And the T shape's in it this week, too! The Joust game's as good as it should be, without being much more. There's a great little Parappa-like "Tune Tap" game, and I'm not sure, but the 5-in-a-line game might be more confusing than it should be! There's also a Lights Out game which is a lot more fun than I thought it would be, so thanks to Darig0n for that suggestion. Just took me a while to bother doing it! Speaking of bothering to do things, I played about with the unfinished Donkey Kong game, again. I actually got quite a way through it, this time, but it's not very "Donkey Kong" like anymore! The main problem right now is that even though the game's engine is fun to play with, there really isn't much in the way of a point to it! So I held it back again! Maybe by release #78 you'll get to play it!